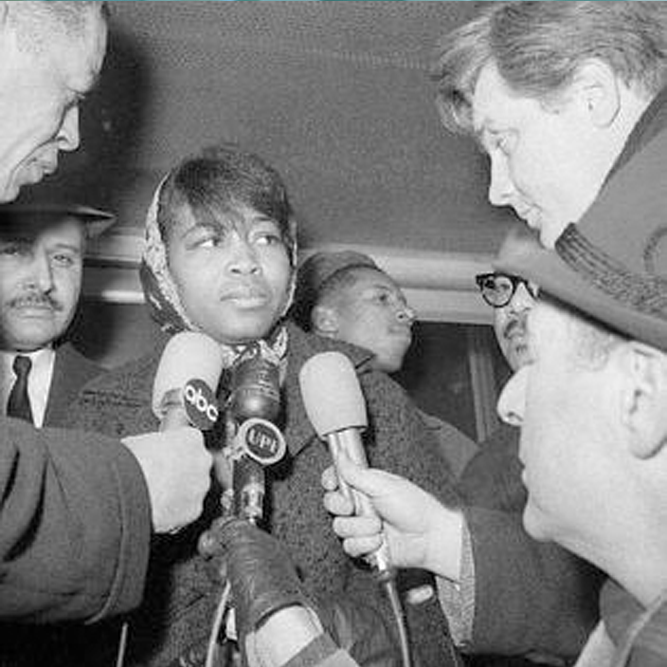 Faith helped sustain Betty Shabazz in the wake of the assassination of her husband, el-Hajj Malik el-Shabazz, or Malcolm X, on February 21, 1965. According to Shabazz’s daughter, Ilyasah, “[M]y mother refused to live her life as a victim. She possessed faith in God, self-respect, and a perspective that did not permit her to say, ‘No, I cannot do this.’” The night Malcolm X was shot, he was in Manhattan, preparing to deliver a speech in the Audubon Ballroom; Shabazz, Ilyasah, and Ilyasah’s two older sisters were present, sitting in the front row. (Baby Gamilah was being cared for by family friends, the Wallaces, that night.) Although Ilyasah has no clear recollection of the events—she was not even three years old when her father was killed—she has heard stories of her mother’s brave actions that night. “I’m told that our mother shielded my sisters and me with her body from the gunfire before attempting to save [my father] with mouth-to-mouth resuscitation,” she has said. And so she didn’t give up. She went on to raise her six daughters, always working to protect her husband’s legacy and the rights of others. Education was important to her: as a Solo Mom, she earned a master of arts degree in public health education and a PhD in education administration. So was putting good into the world. Ilyasah remembers her mom saying, “[J]ust as one must drink water, one must give back,” and Shabazz was as good as her word, founding the Young Mothers Educational Development program, which helped pregnant, unwed teens complete their education. In 1976, Shabazz became associate professor of health sciences with a concentration in nursing at Medgar Evers College in New York. She felt drawn to the school, where the students were primarily working-class women, many of them mothers. She eventually became the director of Institutional Advancement and Public Affairs at the school, a position she held until her death. Shabazz served on an advisory committee on family planning for the U.S. Department of Health and Human Services. She was active in the National Association for the Advancement of Colored People and the National Urban League.